First we cover the entire blade with a mixture of Black SC-00 and Abyssal Blue SC-08. On the hilt we apply a base layer of Brown Leather SC-31 and Inktense Black SC-79. Secondly, we apply a layer starting to define the shines of the blade with Abyssal Blue SC-08. For the hilt, this time we cover only with Brown Leather SC-31, respecting the previous layer in the gaps. Thirdly, on the blade of the sword we continue to define the shines and reflections mixing Abyssal Blue SC-08 and Artic Blue SC-05 doing 1 to 2 highlights as the weapon requires. For the hilt we apply a first highlight starting to define the gold glitter with a mixture of Shahara Yellow SC-11 and Inktense Chestnut SC-81 to intensify the yellow color. We keep increasing the shines of the blade with more Arctic Blue SC-05 over Abyssal blue SC-08, we start to outline the blade edges to emphasize the volumes. On the hilt we apply Shahara Yellow SC-11 intensifying increasingly the golden shines. Coming to finishing the blade, we mix White SC-01 with Artic Blue SC-05 and we use it as maximum reflection of the blade, also we outline the edges to emphasize the volumes. On the hilt we mix Sahara Yellow SC-11 with Lilith Yellow SFG-09 and further intensifying the reflections of the hilt, we begin to give shape to the volumes. Finally we outline the blade and we add a little more shine with White SC-01 only. We can also add cuts and reflections on the blade making scratches with White SC-01 and then outlining those scratches with Abyssal Blue SC-08 on top of them. For the hilt we outline with a mixture of Lilith Yellow SFG-09 and White SC-01 and we add a dot of White SC-01 in the corners. Would it be possible to have level up guides on the eye patch, gun and possibly shoulder patches? Something on the leather straps would be great too! Hello Joe! Sorry for the delay. 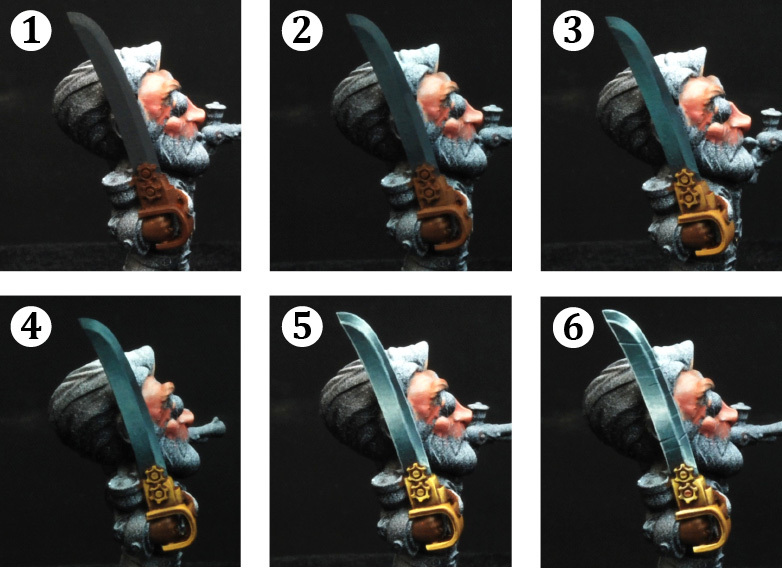 The eye patch, gun and shoulder patches were painted using the same colors as the hilt, you can use those same mixes and it will work perfect. You can vary the amount of Brown Leather SC-31 and Inktense Black SC-79 to achieve different colors for each part and highlight those mixes adding more Sahara Yellow SC-11 or Lilith Yellow SFG-09, using White SC-01 for those interesting shines on the sharp edges. Let us know if it works! About the leather straps, what color would you like them to be? Let’s see if we can help you with that.